We had over 166 different varieties represented and sampled by ~80 folks. Thanks go out to Lori and Brian for a superb job of planning and executing the event, and all of the amazing help from Tim, Lynn, and Bret! We survived the 103° heat with a little shade and plenty of water. For me, the day was dominated by the dwarf table where we had 52 distinct varieties in various stages of selection presented. Rosella Purple was my favorite here, although Sweet Sue, Maralinga, Summertime Gold, Summertime Green, and Sweet Adelaide were additional standouts. We also had our newest dwarf F1, Brawny here with 3 F2 selections I brought. Also preset were a few from the Rosy Line (Rosy F3 and Uluru Ochre) that have a unique green/orange coloration. The red table was rather unremarkable for me. Even my Cuostralee, which I love, was not at its most flavorful. The standouts at the pinks were a large tasty Kosovo and Grandfather Ashlock. KBX was fantastic as usual in the orange/yellow category and it was fun sampling the various Cherokee Purples and Chocolates that were brought in that section. The greens were fantastic again this year, with Cherokee Green and Spear’s Tennessee Green having great flavors. The cherries sampled well again this year, but the standouts to me were Sungold Select II (about as close to the hybrid as there gets!) and Black Cherry. And of course, we had Lime Green Salad Sorbet for all to trial. It was a perfect treat for such a hot day! It was great seeing old friends and new faces. I hope everyone had a great time, and we look forward to next year’s 10th anniversary event! Lee, great pics - and I have to say that although it appears to be so, I am not leading us all in a prayer for the tomatoes! I didn't take any pics, and posted the best of what Sue took in the other Tpalooza 9 thread last night. TBD I'm not at all familiar with this variety, could you give the full name. IT's listed as Best Tasting: TBD & Most Unusual: TBD in the article. I think you might be in for a "duh" moment there oc tony. Not sure but I suspect it means To Be Determined. was doing, she said "I don't know, I wasn't listening." Would have been great to catch that on video! Great picture, Martha - thanks! My shirt is only a little sweaty at that point! It's not hard to see the most unusually colored Dwarf we've seen yet on the left side, a few tomatoes in - several selections, actually - Uluru Ochre! It's what happens when you combine orange and black tomatoes! I have to say that although it appears to be so, I am not leading us all in a prayer for the tomatoes! 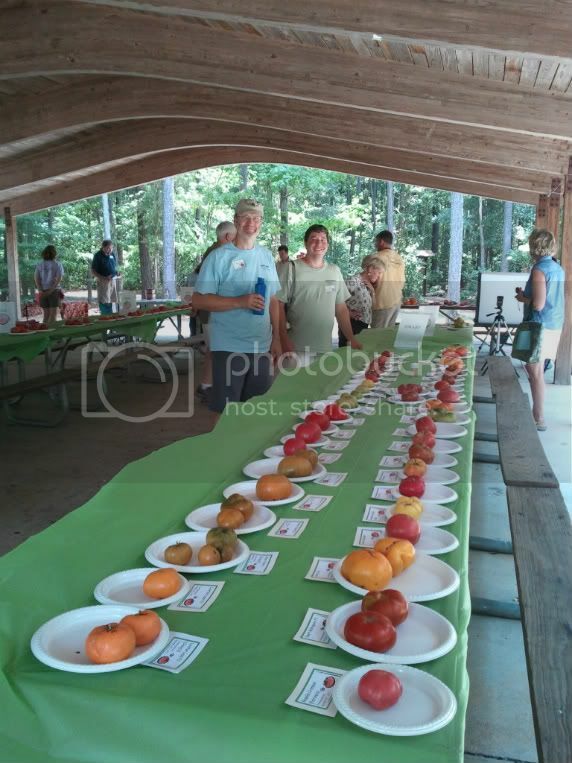 I looked at all the 2011 pics on the tomatopalooza.org site...very cool!!! "The best thing about a vegetable garden is all the meat you can shoot and trap out of it!" My impressions of the day. Where to start, where oh, Wherokowhai do I start? First off I want to say that this event is always worth the drive and this year was no different. I agree with Craig that the heat may have kept some folks away, but we die-hards were going to be there no matter what and a little ole heat index of 115° wasn't going to factor into our decision as to whether or not we made an appearance. After checking in my fruits and getting them situated for their glamour shots, I joined Craig and Lee as they proudly, and dare I say a bit giddily, showed off their latest generations of the dwarf project. I spent more than a few moments oohing and ahhing over all the variety of colors that were there before I pulled out my latest "baby", Chocolate Truffle, not a dwarf, for them to cootchie-coo and ogle over and to show off the fruits I had grown from the dwarf project. OK, I confess, the reason I volunteered to wield a knife and slice & dice for tasting was purely selfish....I wanted to be able to get the choice tasting cuts on several varieties! And there were many wonderful mouthfuls to be had. I started out at the pinks table, which included my RIPE to perfection 27oz Kosovo - which I still say would have won the largest RIPE tomato contest but some folks insisted that the contest was open to all tomatoes, even those that were just breaking color and couldn't be tasted to test whether or not it had been 'doped' ....but I digress . Pinks of note for me were Arkansas Traveler, Burgundy Traveler and Brandywine. None of the reds were new to me but I had a good time reminiscing about why I loved (or avoided) that variety in the past. I'm not sure if it was the heat or my taster was overloaded when I got to the reds but none of them were truly memorable. The dwarf table then beckoned with Chocolate Truffle, not a dwarf but not eligible for seed saving, quickly becoming one that the crowd was wanting to taste along with the rest of the dwarf project. Standouts for me, other than Wherokowhai, were Blazing Beauty, Rosella Purple, Pesty Bi-Color, Summertime Green (so fruity! ), Coorong Red, and TastyWine. Uluru Ochre F3 has such interesting color but the flavor is just not there yet. Lee is definitely on to something with his Brawny line...I volunteer to grow out some for you next year Lee (hint,hint). I then took a palate break and nibbled on wonderful sourdough bread brought by Arivaraci (I'm horrible with names, all I can remember is her T'ville name, but I never forget fresh baked bread - thanks for bringing it with you), while serving up the Lime Green Salad Sorbet. It was a refreshing palate cleanser and nice way to cool off a touch in the heat. Unfortunately the aforementioned heat made the sorbet more like a slushy, then quickly a slurpee, but everyone appeared to enjoy their taste of tomato dessert. The orange table allowed for a side by side comparison of Kellog's Breakfast and KBX. To my palate KB was milder and not as deep flavored as KBX but then again I tend to lean towards the assertive and multi-layer flavored ones. KB is still a delightful tomato but if it was mixed up in a multi color salad I think it would get overshadowed by more assertive greens and bi-colors. Other orange standouts were from the cherry table with Sungold Select II coming awfully close to tasting like Sungold F1. I don't recall the yellows being memorable...nothing was a spitter, but nothing really grabbed my attention either. A new to me variety, Mountain Gold, did have me reaching for a second piece - I was pleasantly surprised at how much more of a balanced flavor it had compared to other yellows and golds. More confession time....I spent way too much time at the bi-color table. Most of them were sooooo good! Lucky Cross, you are on my must grow in 2012 list as are you Hillbilly West Virginia. However Pink Berkeley Tie-Dye- you are on my 'not worth the space' list. Not quite a spitter to me, but close. After grabbing a few Mexico Midget cherries to snack on I made my way back to the dwarf table for more tasting and eavesdropping on what folks were saying about the dwarves and Chocolate Truffle. My palate was numb at that point so tasting was merely for hydration and generalized enjoyment of all things tomato. Being unable to taste another slice, my friend, Dianna and I wandered off around the lake in search of a couple of geocaches and an opportunity to catch a breeze off the water while taking a walk through the woods. After one unsuccessful DNF and a successful find, we arrived back at the shelter to find that most folks had departed and clean up was underway. I snagged and bagged a few fruits for seed saving and spent a few moments debriefing with the organizers over the best tasting tomatoes, (I liked too many to just choose one) and overall impressions of the day (Great as usual but it was time to beat it out of the heat). Thank you again everyone for all the effort and hours your put into organizing this annual event. I'm already making plans for next year. Until then, see you on the boards! Just to give a bit of back story on the Lucky Crosses that made an appearance. They are all part of my old seed growout crew of this year - all from 2002. The ones I brought were 02-59, 02-55 and 02-62. The fourth I grew, 02-57, hadn't ripened yet. The seeds in all three of the Lucky Cross tomatoes at Tomatopalooza are F8 generation - pretty well stabilized (I can't believe they were already F8 in 2002!). Enjoyed the pics and the reports, thanks everyone! Holey Moley that's a BIG Brawny Lee!! Great pics and comments by all. I sure wished I lived closer! !